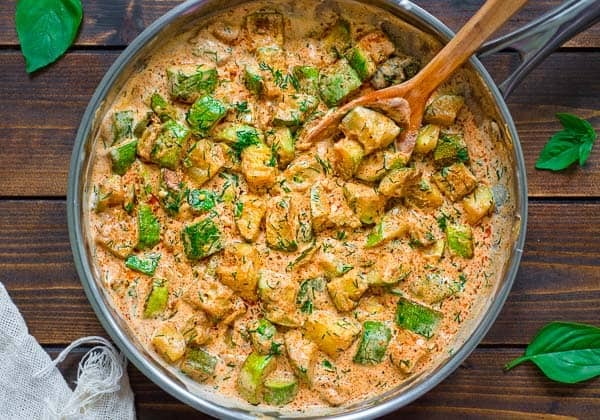 This Creamy Zucchini Sauce is bursting with flavor! 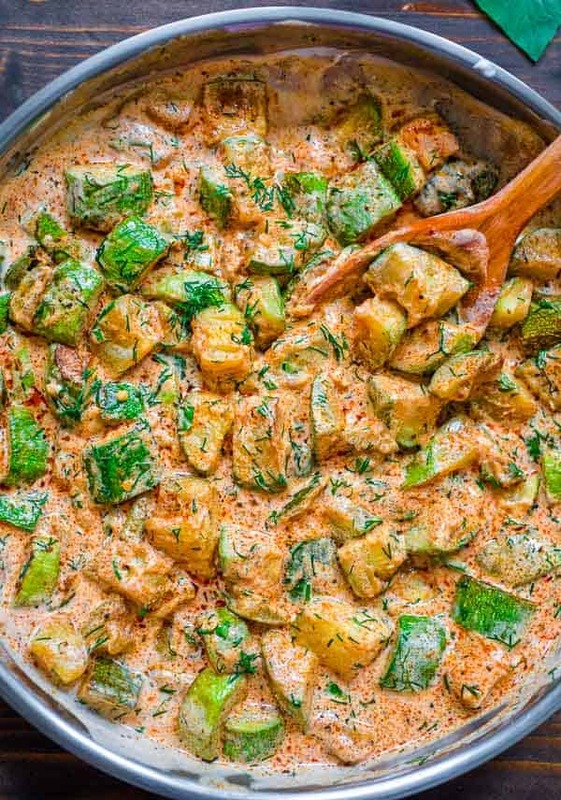 Made with paprika-roasted zucchinis, sour cream, garlic, and fresh herbs, it tastes great with pasta, over rice, or just with a slice of bread. It’s zucchini season and you’ve got to try this recipe! Fresh, flavorful, and so versatile, this Zucchini Sauce pairs well with pasta, quinoa, rice, and many other grains. If you are looking for a filling and tasty vegetarian lunch/dinner, you’ve come to the right place! And on top of that, this sauce is very easy to make. Just mix the zucchini with oil and spices and place it in the oven. While the zucchini is baking, you can whip up the sauce. Mix the sauce with the zucchini and VOILA! Your Creamy-Dreamy Zucchini Sauce is ready. 2. Mix the zucchini with oil, paprika, salt, and pepper and spread onto a large non-stick baking tray. Bake for about 20 minutes, until soft and slightly browned. 3. Meanwhile, place all of the sauce ingredients into a medium skillet, stir, and bring to a simmer. Turn off the heat. 4. Add the baked zucchini to the cream-sauce and mix everything well. Garnish with chopped herbs, if desired. 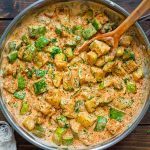 My favorite way to serve this zucchini sauce is to mix it with some cooked pasta (spaghetti, penne, or linguine), or pour a generous amount of the sauce over boiled rice. You may also enjoy it with your favorite grain (quinoa, farro, bulgur, barley, buckwheat, etc.). Or just serve it with some fresh bread. 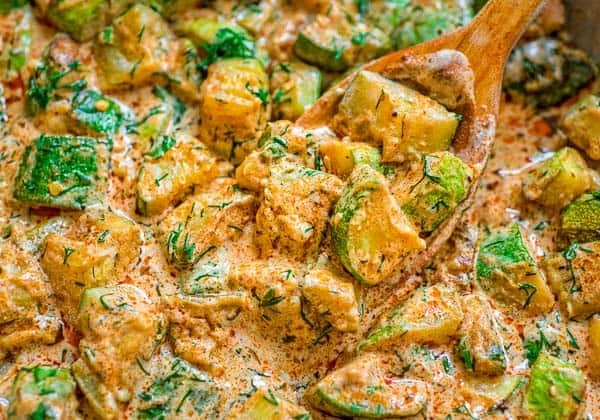 This Creamy Zucchini Sauce is bursting with flavor! 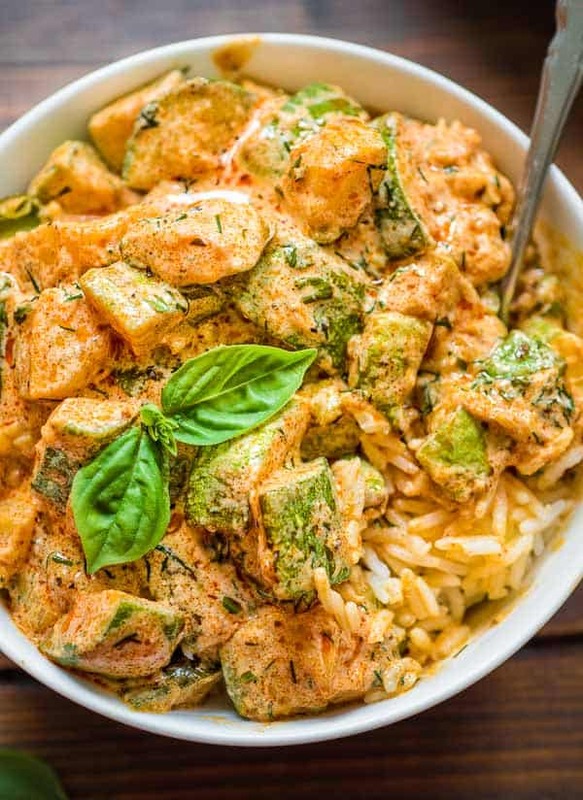 Made with paprika roasted zucchinis, sour cream, garlic, and fresh herbs, it tastes great with pasta, over rice, or just with a slice of bread. 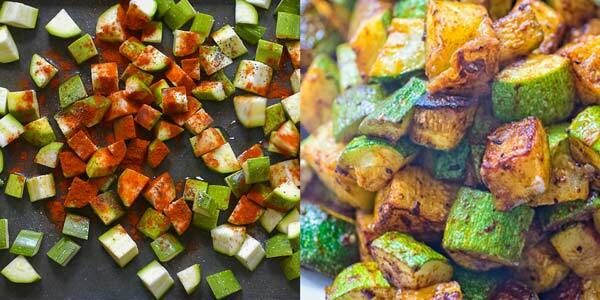 Mix the zucchini with oil, paprika, salt, and pepper and spread onto a large non-stick baking tray. Bake for about 20 minutes, until soft and slightly browned. Meanwhile, place all of the sauce ingredients into a medium skillet, stir, and bring to a simmer. Turn off the heat. Add the baked zucchini to the cream-sauce and mix everything well. Garnish with chopped herbs, if desired. Watch how to cube zucchini HERE. Hi!! Would Greek yogurt substitute the sour cream without ruining the whole thing? Hi Jess! I think the yogurt won’t work here. You can try full fat coconut milk instead. Thanks! I love this recipe! I can’t stop making it! It’s not hard going vegetarian with these type meals. Hi Sandy! Absolutely! Hope you’ll give it a try! Delicious sauce and the perfect meal for summer! My parents used to grow so much zucchini we would eat it almost every night in August and September — luckily, my brother and I loved it. We also grow zucchini in the backyard, Michelle. Love this vegetable! Hope you’ll try the recipe. I really love this Zucchini recipe Tania. So creamy and colourful.